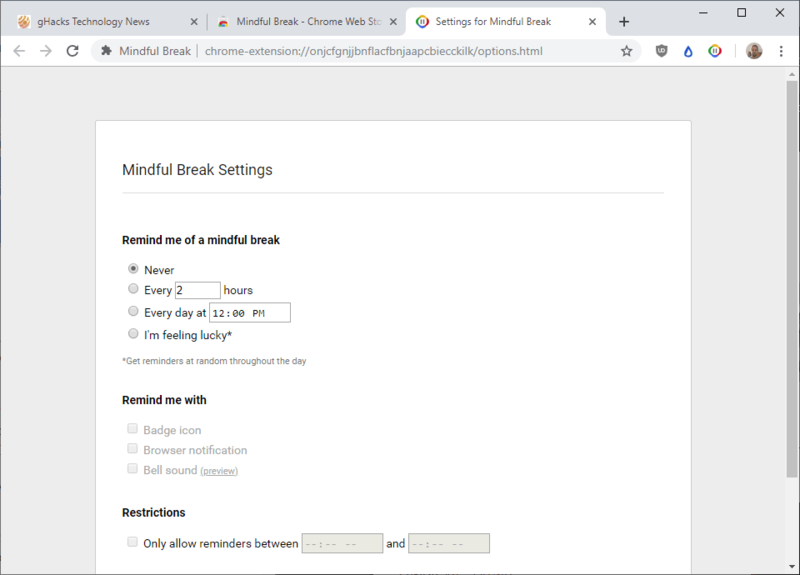 Mindful Break is a free browser extension by Google for the Google Chrome web browser designed to remind users to take breaks and to provide tips on how to spend the time during breaks. Display notifications to the user that act as break reminders. Display tips and exercises on how to take the breaks. Sitting in front of a PC for eight hours or longer is not particularly healthy, especially if you don't take breaks regularly. Taking breaks, small and large, is essential if you work on a computer day in day out. I have my own set of habits to take breaks during work, e.g. to use one of the breaks to go grocery shopping each day of the week to get my body moving a bit. Mindful Break may assist you if you either forget to take breaks regularly or don't fill these breaks with something meaningful. I know plenty of people in IT who spend their breaks in front of the computer using it for other non-work related activities. The extension adds an icon to Chrome's main toolbar that you may interact with. A click on the icon displays some advice and options to take breathing exercises. A click on the "try a breathing exercise" link displays a one-minute clip that helps you breathe in and out during that time period. An option to go full-screen is provided to stay focused on the exercise and blend out any of the distractions on the screen. Mindful Break won't display notifications by default. The default notification interval is set to never; you need to open the settings of the extensions -- with a click on the settings icon in the break reminder window or on chrome://extensions -- to enable notifications there. Options include displaying notifications in intervals, e.g. every 2 hours, at a specific time, e.g. 12:00 pm, or randomly throughout the day. You may restrict notifications so that they are only displayed in a specific time period, and define the type of notification you would like the extension to use. Supported are browser notifications, sounds, or badge icon notifications. The extension runs offline and requires only notification permissions during installation. It has not been updated since 2017 which means that content may get stale a bit after a while (once you read all the tips). Mindful Break is a useful extension for Chrome users -- it may run in other Chromium-based browsers as well - who have troubles taking short breaks when they work extended periods in front of a computer. The extension suggests breathing exercises only; it would have been great if it would support other health-related exercises, e.g, for the eyes or a bit of stretching, as well. PC software, e.g. Eye Defender or Break Taker, offers similar functionality. Now You: Do you take breaks regularly when you use computers? I do take breaks even if unwillingly, like everyone I guess, but they appear naturally so to say. I couldn’t pause my work at regular intervals because that’s not how brains work. You may hold on to a search, a research, an idea, a project but you’ll have to at least finish a chapter to take a pause. Coffee/tea time, then I light my pipe, sit backwards, sometimes in winter open the window and take a deep breath of fresh air, wonder on the mysteries of life, my bills, comments of life and of the Web, I sort of decompress to think at another rythme… but when I decide to, not when a clock rings. Just install W10 and there’s more than enough breaks. Thanks Google for taking so much care for the people! I’m a big believer in mindfulness, but there are two problems: first of all many managers won’t believe that taking a 1 or 5 minute break makes you more productive for the next hour and the other is that most companies would forbid people adding their own software. 5 long slow breaths before answering the phone.